Wilhelm Moritz was born on 29 June 1913 at Hamburg-Altona. He joined the army in 1933 but transferred to the Luftwaffe and underwent pilot training. At the beginning of World War 2, Moritz was serving with II./ZG 1 flying the Bf 110 Zerstörer twin-engined fighter. He participated in the Polish campaign. In summer 1940, Moritz was transferred to II./JG 77. He was assigned to 6./JG 77. He served in Norway and western France with this unit. On 9 September, he was appointed Staffelkapitän of 6./JG 77. Around the beginning of 1941, Moritz became Staffelkapitän of EinsatzStaffel/JFS 4. He commanded the unit until March 1942, although he probably saw no combat during this time. The unit was later integrated into 11./JG 51. From 4 April until 10 September1942, Moritz served as Staffelkapitän of 11./JG 1 based at Mönchen-Gladbach. During this period he was promoted to Hauptmann. He claimed no victories while serving with this unit operating in the German Bight area and over Holland. Moritz was transferred to II./JG 51 on 10 September 1942. From November 1942, he was Staffelkapitän of 12./JG 51. With this unit he claimed around 25 victories on the Eastern Front. On 19 October 1943, Moritz was appointed Staffelkapitän of 6./JG 3 based in Germany. The unit was tasked with Reichsverteidigung duties. Fw 190A-8/R8, W.Nr. 681 382 "<<" of Hptm. Wilhelm Moritz, Gruppenkommandeur of IV. (Sturm)/JG 3. Moritz was appointed Gruppenkommandeur of IV./JG 3 on 18 April 1944. The Gruppe specialised in anti-bomber operations flying heavily armoured and armed single-engined fighters and was referred to as IV. (Sturm)/JG 3. On 8 May, he claimed two USAAF B-24 four-engined bombers Herausschüsse to record his 36th and 37th victories and, on 13 May, two USAAF B-17 four-engined bombers (38-39). Moritz was awarded the Ritterkreuz for 41 victories on 18 July 1944. On 1 October, he was promoted to the rank of Major. On 2 November he claimed a B-17, his 44th and, probably, last victory. On 5 December, Moritz was relieved from command due to a complete nervous breakdown. 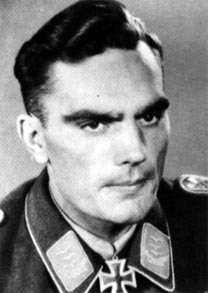 Following his recuperation he was appointed Gruppenkommandeur of IV./EJG 1 on 14 December 1944. On 18 April 1945, Moritz was appointed Gruppenkommandeur of II./JG 4, a position he held until the end of the war. In over 500 combat missions Wilhelm Moritz was credited with 44 confirmed victories. He recorded 25 victories over the Western front, including 12 four-engined bombers. However, some sources quote his total to be as high as 54, including 25 four-engined bombers (including Herausschüsse).